January 24, 2019 12:47 pm. Vincent Ho fired Golden Cannon through a tight alley to secure trainer Francis Lui’s 600th career win at Happy Valley on Wednesday, 23 January. Lui’s standout career triumph to date came with Lucky Bubbles in the 2017 Group 1 Chairman’s Sprint Prize but this latest landmark success was achieved at the opposite end of the quality scale, in the Class 5 Sham Shui Po Handicap (1650m). “I’m happy about that and now I’ll try my best to get more. I never think about these things, I just keep going. It’s not easy!” Lui said of reaching 600. The trainer has an in-form ally onside in Ho who collected his 27th win of the campaign. Ten of those victories have been on Lui horses, accounting for the lion’s share of the stable’s running total of 12 this season. “Vincent is riding well, he’s got more confidence now and he’s improving. I’m happy to see it,” Lui said. Golden Cannon sealed his third career win – at start 34 – with a determined drive that held off Dashing Dart by a neck. “This horse has a good fighting heart and this season he’s taken time to get his condition but the last two runs you could see he was getting there,” his trainer said. The night’s feature, the Class 4 Hong Kong Football Club Centenary Cup Handicap (1200m), went to the David Ferraris-trained London Master. Neil Callan got to work on the seven-year-old with 550m to race, and, rousted wide down the home straight, the Hong Kong International Sale graduate (ISG) edged Travel Datuk by a head at odds of 19/1. Another ISG hit the mark in the Class 4 Siu Sai Wan Handicap (1650m). The Danny Shum-trained Charity Grand landed a breakthrough win by a head under Karis Teetan. Michael Chang has battled near the foot of the trainers’ table in recent seasons but the handler notched his third win this month – at a strike rate of 16.6% – when Joao Moreira rode a calm race to make it two wins on the bounce for The Joy Of Giving. The five-year-old took the 2200m Class 5 opener by a length from Sweet Bean. The Brazilian bookended the card, riding a canny stalking race on Bank On Red and then driving strongly to the wire, adjusting to keep his mount straight late in the run. The John Size-trained favourite survived an objection from Grant van Niekerk on runner-up Arcada. Music Addition left his mark on the night with a powerful display to win the Class 3 So Kon Po Handicap (1200m). The Me Tsui-trained four-year-old raced in close proximity to the pace-setting Blocker Dee and when that rival felt the pressure early in the home straight the Australian import exploded away to a three-length score. “After the turn he gave a good response and he was gone,” said Tsui after the Your Song gelding had opened his Hong Kong account at start three under Silvestre de Sousa. Tsui snagged a race-to-race double when Namjong Plus rattled wide and late to nick the Class 3 Southorn Handicap (1800m) by a neck from Vigor Fame. Keith Yeung was the winning rider. 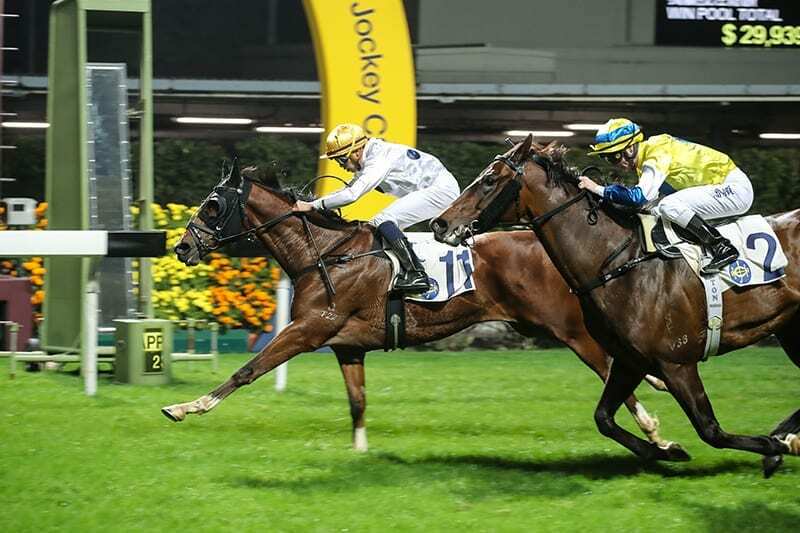 Snap Fit made a winning start to his career in race two, the Class 4 Mong Kok Handicap (1000m), but the four-year-old’s presence on the track owes a lot to Paul Robinson, the Hong Kong Jockey Club’s Head of Veterinary Clinical Services, and his team. Hong Kong racing continues at Sha Tin on Sunday, 27 January when the feature race will be the Hong Kong Classic Mile, the first leg of the Four-Year-Old Classic Series.